2016 Mid-Atlantic Mod Retreat (MOD)! Call for Instructors and Save the Date!! 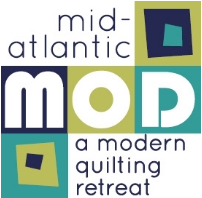 Mid-Atlantic Mod – a modern quilting retreat 2016 (MOD), has announced their Call for Instructors! We have many talented instructors in our guild, please consider submitting a class or two!! The deadline to submit is October 31, 2015. Please click this link for more information and for the Instructor Proposal Form. The Instructor Proposal Form link is at the top of their blog post and in the last paragraph. Mid-Atlantic Mod Retreat DATES: April 21-24, 2016 at the Doubletree by Hilton in Lancaster, PA. This retreat is planned by Central Jersey MQG and the Philadelphia MQG with surrounding guilds also participating. It’s a fantastic retreat filled with SO much to do! Cost information is available here. It was an awesome time, just ask Betsy, Melanie or Daniela! ← REMINDER :: OCTOBER MEETING THIS THURSDAY! Bummer. Would have applied to teach, but Passover begins and the first seder is April 22.